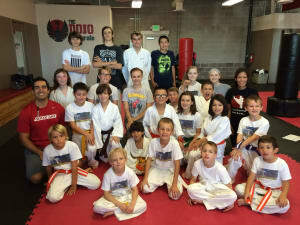 At The Dojo of Karate, we try to get our community of students together for different events and occasions. From hosting martial arts tournaments for students to compete in to, organizing charity events, our goal at The Dojo of Karate is to create community. On Saturday, September 26th over 20 martial arts students joined forces to help raise money for Growing Home, a non-profit organization in Westminster, CO.
During this community wide charity event, The Dojo of Karate put together the inaugural 1,000 Kicks Challenge where students would have to get pledges from friends, family, and possibly co-workers by asking individuals to donate at least $.01 per kick. Students than came to class on Saturday morning and performed a variety of martial arts kicks — from basic kicks such as front kicks, round kicks, hook kicks, and side kicks, to advanced kicks such as tornado kicks and jump spin hook kicks. Kids of all ages and ranks gathered to take on this challenge, and came home victorious. Growing Home is a family organization that is dedicated to helping families in desperate need including assistant for rent, utilities, and food, shelter for the homeless, tutoring for grade school children needing assistance with education, and food for those that can not afford to feed their family. The beauty about Growing Home is that they are locally ran. They are not part of a larger organization, rather they get their funding from donations, state / government assistance, and a yearly fundraiser held in the spring. The Dojo of Karate students took pride in helping Growing Home, as they found this as an opportunity for them to contribute to their community. During the 1,000 Kicks Challenge students at The Dojo of Karate raised nearly $2,000, which is a great accomplishment for the first of having a community wide charity event.